CareeMate is a very powerful, comprehensive, holistic and fully integrated career counselling tool. Its power is most obvious and appreciated when working with difficult and/or "at risk" students/clients. CareerMate can achieve major break-throughs in one in-depth career counselling session. The CareerMate report is used as a non-threatening but comprehensive and enlightening focus for understanding self and discovering motivating career and life options. CareerMate includes all the benefits of Career Builder, but has the added power of an integrated personal preferences (personality) profile and career planning elements, together with intensive career counselling training. CareerMate is designed to be used with school students and school leavers, but because of the multiple pathways included (depending on age and personal circumstances) it can also be used with adults. Self understanding is enhanced through analysis of education and work history, skills, interests, personality, values, aspirations, personal circumstances and other influences. Career exploration is facilitated through exploration of likely compatible Industries, Career Clusters, Occupations, Occupation Specialisations and Career Combinations. It is usually the discovery of career combinations, based on a person's unique combination of strengths and preferences, that ingnites the inner passion of students and school leavers (particularly those who are "at risk"). These discoveries usually result in break-through changes in motivation, and a willingness and commitment to develop realistic and achieveable action plans, and to work co-operatively with others to achieve their goals. The CareerMate report acts as a focus for discussion and helps a person to better understand their own strengths and preferences. Possible consistencies and inconsistencies between personal strengths, preferences, circumstances and options are highlighted. 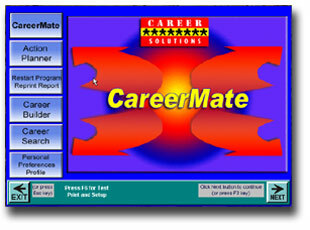 First the CareerMate compuer program is completed (takes about 50 minutes). It is colourful, well structured, and easy-to-use. The program walks you through your background and helps you to identify your unique combination of strengths and preferences. Self understanding is enhanced through analysis of education, work history, skills, interests, personality, values, aspirations, personal circumstances, and external influences. Likely compatible Industries, Career Clusters, Occupations, Occupation Specialisations and Career Combinations are explored to facilitate well informed decision making. A detailed but easy-to-read CareerMate report is generated. The report outlines the findings of the self understanding, career exploration and career decision making processes. The report also notes any inconsistencies between personal strengths and preferences, and career option preferences. The report is used as a shared focus for the career counselling session. The counselling skills of the career counsellor, together with the experience of completing the CareerMate computer program, and having the CareerMate report as a focus, creates a non-threatening, creative learning environment in which to unfold a person's story about their background, strengths, preferences, dreams and aspirations, and influences on their decision making. As part of the career counselling sesssion a detailed action plan is developed with the student/school leaver. To facilitate commitment and progress tracking it is also recommended that the student/school leaver later completes and regularly updates the Action Planner computer program supplied with CareerMate. TIME EFFICIENT - Completion of the computer program (approximately 50 minutes) and one in-depth career counselling session are very time efficient means of achieving positive break-throughs with difficult and/or "at risk" students/school leavers. The focus with CareerMate is about helping people to understand and discover their unique strengths and preferences, and also how the the integration of these attributes can be positively used to achieve fulfillling career and life goals. Usually these students/school leavers have already consumed considerable human resources and have demonstrated their frustration overtly (eg. physically and/or verbally) or internally on themselves (eg. low self esteem, lack of motivation, substance abuse, poor performance). CareerMate has the power to quickly convert the energy of a destructive cycle into a virtuous cycle. HOLISTIC and INTEGRATED - CareerMate is holistic (includes career, relationship, personal and contextual considerations), very comprehensive and is a fully integrated career guidance and counselling system. COMPREHENSIVE CAREER EXPLORATION - The database includes over 3,500 career options, which cover all educational/occupation levels. CareerMate facilitates the exploration of likely compatible Industries, Career Clusters, Occupations, Occupation Specialisations and Career Combinations, to ensure well considered career decision making. Career Combinations often generate the student's/school leaver's most satisfying career options. COMPREHENSIVE CAREERMATE REPORT - A comprehensive and easy-to-follow CareerMate report, including an Action Plan pro-forma, is automatically generated (in addition to a summary report for the career professional - which can be turned off if not required). CAREER COUNSELLING - The report is used as a shared focus for the career counselling session, and helps the student/school leaver to better understand their strengths and preferences. Any discrepancies between personal strengths, preferences, circumstances, career options, and personal goals are explored. Resources and barriers to goal attainment are also identified and explored. A detailed action career and life action plan is developed to achieve the student's/school leaver's goals. ACTION PLANNER - BONUS This advanced and integrated goal setting and action planning software is supplied with CareerMate. It includes goals, action planning steps (tasks), resources, barriers, contingency plans, achievement recording, and progress tracking and follow-up. Action Plans and chronological To-Do-Lists are produced. The Action Planner program also provides the career counsellor with a useful tool to follow-up and track a student's/school leaver's progress. SELF EMPOWERMENT - CareerMate is designed to encourage students/ school leavers to take responsibility for their own career decision making and planning. DECISION MAKING - With CareerMate, students/school leavers are walked through a unique process of broadening and refining their self understanding and career options, in order to arrive at well considered career and life decisions. They learn the skills needed to make well considered career decision, to set goals, and to plan action steps designed to achieve their goals. MULTIPLE PATHWAYS - The program automatically follows different pathways, depending on the person's age and personal circumstances. CareerMate is most suitable for students/school leavers who are 15 years and older. MANUAL - The comprehensive manual includes getting started instructions, very comprehensive one-on-one career counselling notes, and overhead projection transparency masters (now on CD). PROGRESS TRACKING and FOLLOW-UP - CareerMate enables career counsellors to easily and quickly produce reports of program usage and student/ client preference patterns for course/training planning, research, evaluation and follow-up purposes. Action Planner enables career counsellors to track progress towards achieving goals and tasks. SOFTWARE CUSTOMISATION - Software is customised with the school's/ organisation's name appearing on the program and printout. School/organisation specific information, such as the names and contact details of school and/or community career personnel, and career functions and dates can be included in the CareerMate report and regularly updated. SCHOOL SUBJECTS State specific (for Australia) Year 11 and 12 school subjects are supplied, which assists Year 10 students with subject selections. Country specific Year 11 and 12 subjects are included for overseas orders. The list of school subjects supplied can be further customised to reflect only the subjects offered in the school. This is easily achieved by using the SETUP program supplied and adding or deleting as required. TRAINING - The in-depth, two-day training for career counsellors includes practical CareerMate career counselling demonstration and supervised career counselling of three students/clients. "It's only since I started using CAREERMATE that I felt I was able to offer a really integrated and comprehensive career guidance service for our students". "Since I went through CAREERMATE, I've noticed a profound change in my approach to work. As a consultant, I now realise where my real strengths lie, and am more accepting of my own weaknesses. I really wish I could have done this when I was starting my career". "I didn't have a clue what I wanted to do and was worried. Everyone else seemed to have ideas. At school I did CAREERMATE and was surprised to find jobs and courses that I could picture myself being happy in. It was easy and I learnt a lot about myself". Click below to see examples of the report generated at the end of the CareerMate session (requires Adobe Acrobat Reader). The CareerMate database, program and support materials are updated annually to ensure that your students/school leavers use only the most recent career information resources. Software is customised with the school/organisation name appearing on the program screens and on the report. You can customise the school subjects, and include a school/organisation specific statement at the end of the report, and customise the Action Plan. Parts of the program can also be turned off if not required.